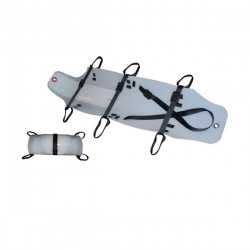 A simple, low cost, robust stretcher that can be deployed very quickly. Ideal for Mass Casualty Evacuations! Can be dragged along floors, narrow corridors, up companion ways, along sewer pipes, up railway embankments, across open ground - the skin is low friction, does not ruckle or snag and the unit weighs in at under 6 kg. Fast fit/adjust buckles rated at 200K Six easy grip Carry handles. All Closure/Carry handles user replaceable.